Climbing as a sport has been growing increasingly popular in recent years, thanks in part to the release of professionally made documentaries on the sport. 2018 was a landmark year for climbing films, with three climbing films out for widespread release. I had the opportunity to see Reel Rock 13, the Dawn Wall, and Free Solo in theaters and thoroughly enjoyed each of them. If any of these might interest you, my reviews of each film are below. All three were excellent and inspirational, but all very different from each other. Disclaimer: Spoilers may be included. Probably not. These climbing films are documentaries, so there’s no plot twist endings and you know what is going to happen before you even see the movie so I can’t spoil too much, but you’ve been warned. Reel Rock is a series of 4 short climbing films released annually. I’ve gone to see it in theaters the past two years, and it is a wild event with the entire theatre cheering and reacting to the movie. This film is a bit different than any of the other documentaries released because it includes multiple films. This last year, the shorts were Age of Ondra, a film about superstar climber Adam Ondra, Up to Speed, which follows the growth of speed climbing and its inclusion in the 2020 Olympics, Valley of the Moon, a film about the little known climbing area of Wadi Rum in Jordan, and Queen Maud Land, which shows the onslaught of climbing achievements by a squad of professional climbers in Antarctica. The first film, Age of Ondra, is ridiculously impressive. My palms were sweating the entire time as I watched Adam Ondra, the world’s most talented technical climber, cling to unimaginably small holds and contort his body into insane positions. This one will leave you speechless and impressed at the talent and drive which makes Ondra capable of flashing world class routes, and leave you inspired to put a bit more effort into your training. Valley of the Moon was the most surprising film for me, one that I really enjoyed. It was inspiring to see the sport grow in an area known more for violence than exceptional climbing. Wadi Rum looks like it could house world class climbing, so it will be interesting to see how the sport evolves in Jordan, and how climbing could rejuvenate a struggling tourist economy. Up to Speed was a comical take on an unconventional mode of climbing, but certainly one that deserves attention given that it is now an Olympic sport. I loved watching barriers be broken and watching athletes inspire entire countries through speed climbing. This was a film I wasn’t really excited about before the release, but ended up enjoying more than I expected. Queen Maud Land was the film I was most excited about, starring athletes Alex Honnold, Cedar Wright, Conrad Anker, Savannah Cummins, Anna Pfaff, and Jimmy Chin. Antarctica is astoundingly beautiful and it was thrilling to watch these all stars conquer several first ascents and unbelievable big walls. Of course, Jimmy Chin had exceptional filmmaking and Cedar Wright brought plenty of humor to the upbeat film. The North Face team of athletes brings it all to the table in my favorite of the four shorts. This is the traditional inspirational climbing film, following one of the greatest climbing feats of the century as Tommy Caldwell and Kevin Jorgeson attempt to free climb the hardest continuous route in the world on El Capitan. More than just a climbing movie, this film explores the series of unfortunate but life shaping events that drove Caldwell to spend 6 years of his life obsessing over a single wall. Jorgeson was an unlikely partner to climb with Caldwell, but the pair managed to overcome a series of challenges and perform exceptionally well under intense pressure. It is difficult to perceive just how difficult it is to climb pitch after pitch of 5.14d, broken up by “easy” 5.13 climbing. Watching this film on the big screen illustrates just how impressive this feat is, and whether you know anything about climbing or not you’d be shocked at the achievement. I’ve now seen this film four times, and I went ahead and bought the digital version as soon as it was released. My parents, who know very little about climbing, watched the film with me and thought it was excellent. It is a film anybody can get behind and one that will inspire you to attack your next project with renewed vigor. This film was released in theatres worldwide, and if you’re lucky you might still find a showing near you. The digital version isn’t out yet, but it’s worth seeing this movie on the biggest screen you can find. The documentary was released by National Geographic and produced and directed by Jimmy Chin and Elizabeth Chai Vasarhelyi, the same filmmakers of the award winning documentary, Meru. As amazing as the cinematography in Meru was, the filming in Free Solo is even better. They are able to convey the magnitude of Alex Honnold’s ropeless, free solo ascent of 3,000 foot tall El Capitan in a beautiful manner. Beyond just mind blowing camera angles and a close look into the personal life and motivations of Honnold, the soundtrack in the documentary adds to every scene, a wonderfully chosen, very fitting score. I saw Free Solo in theatres twice because I enjoyed it so much. This might just be my favorite of the 3 climbing films, which is why I saved it for last. I went in expecting to see a film about one of the most impressive climbing feats ever, and one that will probably never be repeated. I saw a film about so much more than that. It goes beyond the climbing and becomes a philosophical film, one that makes you leave the theater with questions swirling in your head. I regarded Honnold as a bit of hero before seeing the film, but left unsure of how I feel about him. As talented and athletic as he is, it’s hard to cheer for a guy that has no regard for how his actions impact those closest to him. Free Solo was excellent, another film that can be appreciated by a wide audience beyond the dirtbag community. 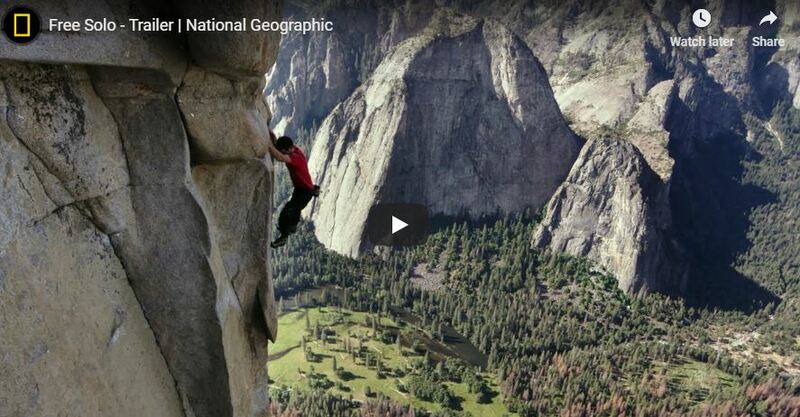 It is difficult to comprehend the difficulty of Honnold’s climb as well as the danger of it, but Jimmy Chin does a great job of showing these aspects. There is a shot in the film that shows Honnold approaching the top of El Cap as the camera pans out, exposing just how massive the granite monolith is and leaving you speechless at the wall he has just climbed. It is no surprise that the documentary has received raving reviews and you won’t be disappointed.